Mini Modern: Casa Bella Dollhouse by Selecta...Discontinued? Casa Bella Dollhouse by Selecta...Discontinued? I am under the impression that the modern Casa Bella dollhouse by Selecta is discontinued. The dollhouse cannot be found on the company's website and several online retailers who sell the item have marked it down. So---if you were looking to acquire this house for your children (present or future) or yourself, you should probably go forward. 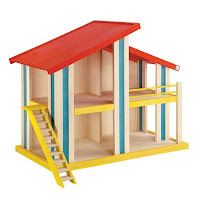 The dollhouse sold for about $150-$160 and is available on Moolka.com for $114.39 with free shipping. Hopefully Selecta will produce another modern dollhouse--and one much more modern than their Casa Rosa dollhouse that is still in production. Dude, it is now $99.99 on Moolka.com! I got my daughter all of the selecta ambiente furniture and put it in the plan chalet dollhouse because I liked the look of that house better. It just didn't fit. I am so glad I saw this post, I got the last one on mookla for $99 (though I had to pay $43 to ship to HI). I think it may be the last one online! I am very glad that this helped you. I dig the Selecta ambiente furniture too. I'm hope your daughter loves the new house.